Cream butter and 1/2 cup sugar until light and fluffy. Add eggs, one at a time, beating well after each addition. In another bowl, whisk flour and baking powder; gradually beat into creamed mixture to form a dough. Divide dough in half; shape each into a rectangle. Wrap in plastic; refrigerate 1 hour. Meanwhile, in a small saucepan over medium heat, combine pears and remaining sugar. Cook and stir until sugar is dissolved and pears are softened, 6-8 minutes. In a small bowl, mix cornstarch and water until smooth; stir into pear mixture. Return to a boil, stirring constantly; cook and stir 1-2 minutes or until thickened. Remove from heat; cool. Stir in raspberries. Preheat oven to 350°. On a lightly floured surface, roll one half of dough into a 15x8-in. rectangle. Cut into ten 4x3-in. rectangles. 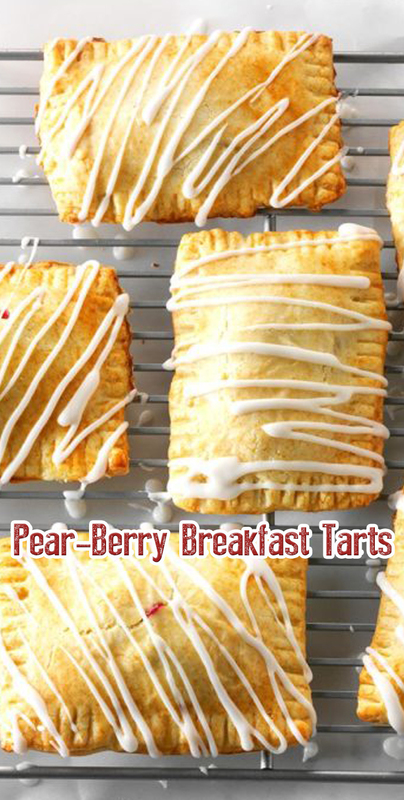 Transfer to parchment paper-lined baking sheets; spoon about 2 tablespoons filling over each pastry to within 1/2 in. of edges. Roll remaining dough into a 15x8-in. rectangle; cut into ten 4x3-in. rectangles and place over filling. Press edges with a fork to seal. Whisk egg white and 1 tablespoon milk; brush over pastries. Bake until golden brown and filling is bubbly, 20-25 minutes. Remove from baking sheets to wire racks to cool. For icing, mix confectioners’ sugar and enough of remaining milk to reach desired consistency; tint with food coloring if desired. Spread or drizzle on pastries.